Souvenir City, 15,000 sq.ft. of Canadiana items & gifts. 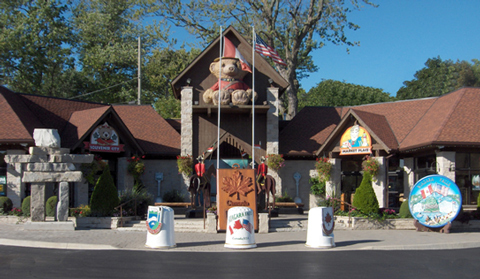 Souvenir City Headquarters is one of Niagara Falls’ largest FREE tourist attractions which feature a vast selection of Niagara Falls and Canadian-themed souvenirs and gifts. Located conveniently along the scenic Niagara Parkway, just 5 minutes north of the Niagara Falls. Souvenir City Headquarters is a One-Stop-Shop, featuring a Gift Shop, Food Court, Fudge Factory etc. You may take free photos with the larger-than-life Canadian icons like 15-foot-tall Inukshuk, Mounties, Carved Native, Teepee, Spoons, Thimbles, Moose etc.